I liked RAB's posts so much that I thought I would re-post them. Hmmm. Actually no idea what happened there, other than I tried to submit my post and that came out. Long story short, went last night to do a quick GNR assessment, and thought the wings very good, if the hotness-level/ordering a little frustrating (we asked for hot and got not so much). Still, a very good product, and had the bonus enjoyment of really liking the black noodles -- appreciating the mellow flavors and comfort food aspect. Nice meal for a rainy Sunday night. Support from this corner for Great Seas' GNR. If my other, more-detailed post magically appears at some point, all of the observations in that post shall govern (it's a yes to the GNR as well). I have never dined in at Great Seas but have come here for take out dozens upon dozens of times for, oh, over 14 years now. The wings are as amazing as the first time I remembering having them. They offer one dish that has consistently satisfied over the years (at any imaginable heat level) and I truly think that this should be enough for them to get GNR status. I visited Great Seas over the weekend and have to agree with most of what Rich said. I ordered the wings hot and got something that was totally sweet. I assured them I could take the heat, but it seems they're more worried about losing customers because the wings are too hot rather than too sweet. That said, I really liked the wings. 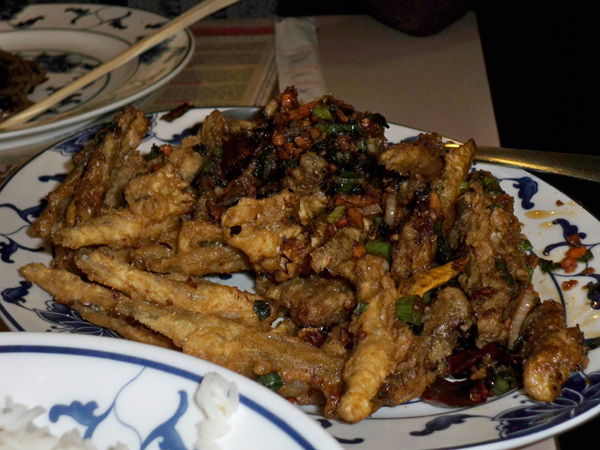 Great crunchy texture, not greasy, sticky sauce that would have gone great with a lot more heat. I can't say I had an incredible wing there because they didn't bring the heat, but I can extrapolate that the wings can hit a pretty high level when you convince them you can take it. I thought the black noodles were so so. I liked the noodles themselves, but the sauce struck me as kind of bland and unpleasantly gooey. Definitely the kind of flavor and texture I'd associate more with a middling takeout joint. There's no question this is a place specializing in the chicken wings. When you walk in the door there are pictures of the wing-eating champion prominently displayed in the front. Every group I saw when I was there ordered the wings, so the word is out. I'd go back for the wings, but I'll probably bring a bottle of hot sauce and chug it in front of them to get them to give me the real deal. Ahmad Shareef wrote: and thought the wings very good, if the hotness-level/ordering a little frustrating (we asked for hot and got not so much). Still, a very good product, and had the bonus enjoyment of really liking the black noodles -- appreciating the mellow flavors and comfort food aspect. Nice meal for a rainy Sunday night. Support from this corner for Great Seas' GNR. 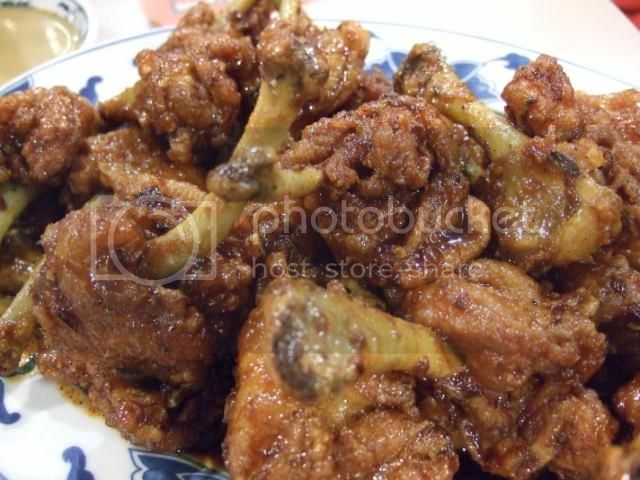 If you want the wings really hot go up on the X scale, but beware Great Sea can really bring the heat. Part of the problem is what is hot for most diners is mild or med-hot for many LTHers, me included. I stopped by Great Seas at the end of a Friday evening wander to other GNR nominees, and a couple of cocktails. My only regret is that it seems I did not drink enough first. I ordered correctly - chicken wings and black noodles. I left my fate in the hands of the kitchen and took the spiciness they wished to deliver and it definitely could have been spicier, but I would not call it primarily sweet. It was not really hot, but there was a bite, an enjoyable bite, and a bit of heat. I am often one who orders things as hot as they can come, who believes a meal has not been truly successful unless my head is dripping sweat and my taste buds crying uncle (why is Double Li suddenly coming to mind?). But lately I have been letting kitchens guide me more, not sure why, just seems right. Anyway, excellent comfort/drunk meal, damn near perfect pitch for that. Bright blend of seasoning, great crust, nicely cooked meat, and the black noodles served as a good counterpoint when I wanted more than the rice. Are black noodles ever more than a complimentary dish? Just curious what others think. Me, I have only had them as an earthy, starchy side dish, and have a little difficulty imaging them as anything more than that earthy, starchy counterpoint, but maybe there are places that make such wonderful black noodles that they can stand on their own. In any case, we consumed our food, grinned and we miraculously found ourselves more than sober for the drive home (perhaps because we had not drunk enough). Great wings, good buzz in the dining room, good time. I was fortunate enough to lunch on some fantastic wings today with a couple of Great Sea regulars. One of said regulars placed our order, explaining in a few different ways just how "X" or "Extra" he wanted our wings to be prepared. After he was done, the other regular told him he had probably just screwed it up. They argued over this for a bit, and then - luckily, one of the staff members who knew them both came over before the order had been fired. The proper Xing was finally worked out amongst the three of them. In short order, our table was filled with an order of "2X" wings and an order of "hot" wings. The 2X were spectacular, not just because of the heat, but because of the roasty, almost coffee-like dried pepper flavor. The sauce tasted like chile de arbol, which I love, though I suspect they use something else. The "hot" wings were not nearly as good, but not really because they were milder. The sauce seemed based on a completely different, lighter-colored and less complex pepper, and for some reason the "hot" wings were not particularly crisp or warm. The "2X", by contrast were piping hot and super crisp, in addition to delicious. I also enjoyed the mushy noodles with mildly fermented black stuff quite a bit. I'll have that homey dish again when I return, though I'll pass on the ultra-bland kimchee and potstickers that we also shared. Great Sea was hopping today with a happy crowd that reflected the incredibly diverse ethnic makeup of the neighborhood. Not too many places draw such a wide mix of customers, and I suspect at Great Sea it's due to the comforting nature of the food and the welcoming warmth from the very friendly staff. i went to great seas last night and was extremely disappointed in the wings. i did order them "extra hot" and i was warned that they're really hot. i nodded and she accepted my request. upon my first bite i thought, "not very spicy, just like LTHers have said". but then i found myself sweating. "interesting," i thought. unfortunately, regardless of how interesting it was, these wings are good but far from great or anything special. 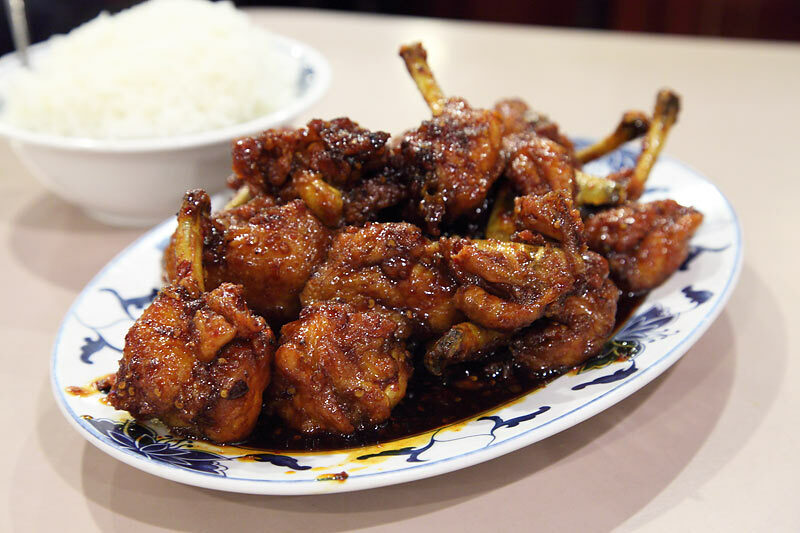 the yunnan pork ribs at spring world or the dry chili chicken at double li or lao sze chaun blow these wings out of the water. ok, maybe not a fair comparison since these wings are wet. to that end, they're too wet! maybe i'm missing something or maybe i got a weak batch. the zha jian mein however, was good and interesting. i don't know how it compares to other places as i think i've only had it back home when my parents made it for me as a kid. So the name of this forum is culinary chat. A place that doesn't have the skill to spice up their food without dropping a ton of industrial grade Sysco sourced hot sauce is somewhat suspect. Those wings look okay, and while Bon Chon is Korean fast food, I'll bet anything that Bon Chon wings would make whatever that is pale in comparison. So really these are the best wings in Chicago? sr1329 wrote: So the name of this forum is culinary chat. A place that doesn't have the skill to spice up their food without dropping a ton of industrial grade Sysco sourced hot sauce is somewhat suspect. Those wings look okay, and while Bon Chon is Korean fast food, I'll bet anything that Bon Chon wings would make whatever that is pale in comparison. So really these are the best wings in Chicago? Go try them and decide for yourself. Even if everyone here loves them, which they don't, it doesn't mean you will. You found us out, just a bunch of opinionated d-bags with no taste. Oh, wait, you are the one comparing a fast food chain, that's not available in our area, to a neighborhood mom and pop place you have not tried that has been going strong for 25+ years. No sysco at Great Sea, they make their own noodles and sauce for cha chiang mian and sauce for crispy spicy with hint of sweet gampongi. Hey, you two moderators, is it possible for you to not squash a newbie with just 15 posts? Give the guy a break. Upon further review, Ronnie, you did not try to squash, so sorry about that. Katie wrote: Upon further review, Ronnie, you did not try to squash, so sorry about that. Yeah, it's generally difficult to have a meaningful conversation about the quality of a place -- any place -- if one of the people in the conversation has never been there. I like Great Sea but could easily understand it if someone didn't. However, when the opinions start flying, especially when they're not backed up by actual experiences, it's all too easy to get frustrated. Just this once, forgive us? Okay, Okay I will go and try it. But I can't understand why they are doused in some sauce. But for me unfortunately Bon Chon the fast food wings so far are the gold standard. It may be a "fast food" chain, but the wings are made to order and take about 20 minutes to arrive. The crispy, thin, non greasy texture with that light glaze is to die for. I think everyone should try them when In NYC, Boston, DC, LA or Korea. Their doubled fried process has taken wings to whole other level. EDIT: Closed already, so I guess tonight won't be the night. sr1329 wrote: So the name of this forum is culinary chat. A place that doesn't have the skill to spice up their food without dropping a ton of industrial grade Sysco sourced hot sauce is somewhat suspect. Haveing just read your comments in the Bad Apple thread it dawns on me you have the mistaken impression Great Sea uses commercial hot sauce (Endorphin Rush) on the wings. If you reread the thread you will see that Endorphin Rush was simply used as a comparative, I wasn't implying that was what was used. Further, the astounding heat leave on this particular visit was the owner complying with my seriously absurd request that we wanted the top of our heads blown off. I suggest you reread the thread before calling Great Sea out for using sysco sauce in additional threads. When you go to Great Sea ask for extra extra hot, two extras, this is how I order them and the heat level is noticeable, but not overpowering. sr1329 wrote: Those wings look okay, and while Bon Chon is Korean fast food, I'll bet anything that Bon Chon wings would make whatever that is pale in comparison. So really these are the best wings in Chicago? If you are talking about the Bon Chon chain in NYC, then you are wrong. I like their wings, but I can't eat them without feeling that I am eating mass-produced junk. There is something to them that feels stale, uniform and processed. Not so at Great Sea, my favorite spot for wings in Chicago, where the wings are definitely junk food, and definitely taste homemade, not like they came from KFC Korea. Suzy Creamcheese wrote: Is this the place that also has spicy fried smelts? I couldn't find a menu online. If so, that's two fine dishes. They did have the smelts. Although i liked them they were very salty. Pretty sure it was MSG by the long thin crystal structure. I’m not complaining, I have no qualms with MSG. I enjoyed the smelt as i do most salty korean fish, just eat it with plain white rice and it's delicious. It took me too long to make my first trip great sea. As soon as I tasted the wings I immediately regretted not going sooner. They were amazing. I ordered them "two X" and reiterated "extra extra spicy" and i was not disappointed. They were dark, crispy and the perfect level of spice for my liking. Just enough that i needed the occasional cool down. By the way, that wimpy kimchee which has been mentioned was prefect device to cool the mouth. It has possibly been five or six years since I walked into Great Seas last. On a Monday evening around 7:30, nearly every table was full. Only three tables did not order chicken wings. At least half of these tables, their focus was chicken wings with many ordering fried rice as well. 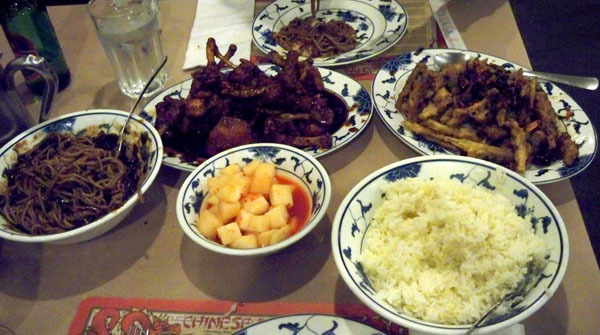 If a table was occupied by more than two people, they tended to include one or more additional dishes. I heard one guy recite to his tablemate, "There are only three Chinese restaurants I go to: Phoenix, here and Sun Wah BBQ." The tables ordering chicken wings were all young, my friend and I were the only old foggies ordering wings. The people who did not to have the chicken wings, were my age or older. I watched one solo diner return his non-chicken-wings food for reasons I could not hear. When his order was returned, he doctored it with salt and soy sauce causing me to curl my toes. I don't know anyone who uses soy sauce at the table who is younger than me. I do see it often with an older generation, my Uncle hasn't even tasted the food before he douses it with soy sauce. My friend regularly orders Buffalo wings, which is why I thought this place might be liked. 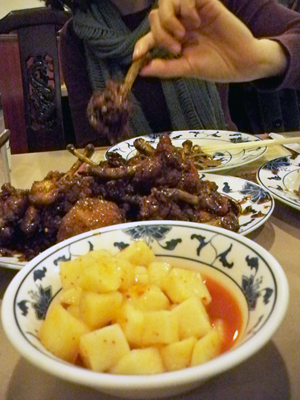 I was impressed how well the crunchy texture held up for our entire meal while not soaking up the sauce and softening. We ordered medium heat, which was fine until we finished when heat caught up with us. Enjoyed the rogues gallery of people who were documented wing eating champions. I think the high score was around 90. Hadn't been to Great Sea(s) in maybe a year, but returned to great disappointment today. Here's what I got: mapo tofu that was bland & not spicy; Mongolian beef that was overly salty; & dry hot wings focused more on a red-pepper heat & probably prepared differently from before. I'd been a loyal fan for roughly the last two decades but had been going less frequently as of late. Anyone else experience something similar in terms of changes over the last six months -- or should I chalk this up to a fluke Sunday accident? A friend also in attendance noted that they were laying the soy sauce on thick for the fried rice even before today, perhaps catering to a different audience lately. Can anyone else confirm changes in how the kitchen is operating? I would not ever come back if the results remain so underwhelming (which is a really sad thing to write). fastfoodsnob wrote: Can anyone else confirm changes in how the kitchen is operating? Not me, I was at Great Sea Monday and the wings were as good, if not better, than ever. Potstickers top of the key as well, house made dough, filled daily, a must order along with the wings. Great Seas had been on the short list for years. Finally popped in last night after Korean BBQ. These wings were top notch. Ordered them "hot/spicy"... Man, great. Crunchy, candylike exterior, juicy meat. Sweet and then a creeping heat that left my tongue and lips pleasantly numb. made Great Seas the place to be after a visit to Toons on Saturday. Those drummy lolypops are addictive..
jimswside wrote: Those drummy lolypops are addictive..
Nice picture. For something so tasty Great Sea drumettes never seem to look good in photos. Great Seas is becoming a stop almost every time I come into Chicago(3-4 times a month all of a sudden)... Quick in and out, not alot better than to pop in, enjoy a cold beer & share a plate or two of those drummies and bowls of white rice..
To help kick of the 2013-14 football season, I got an order of 2X hot wings from Great Sea yesterday. 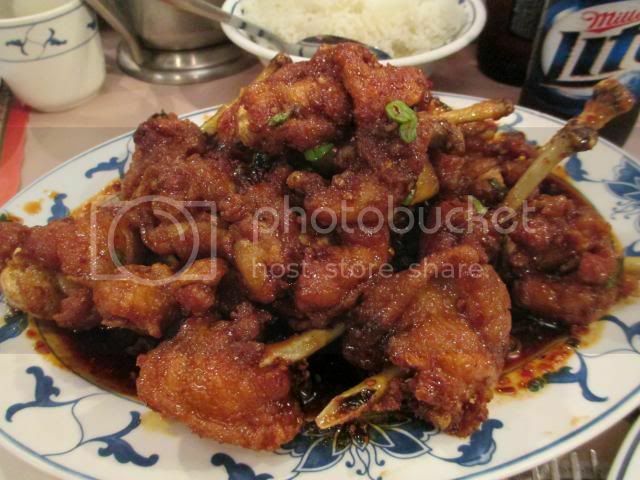 They continue to put our the best Korean chicken wings in Chicagoland. They brought the heat, but not at the expense of flavor. Great Sea is still a GNR in my book, even if it's only for this one dish. stevez wrote: To help kick of the 2013-14 football season, I got an order of 2X hot wings from Great Sea yesterday. 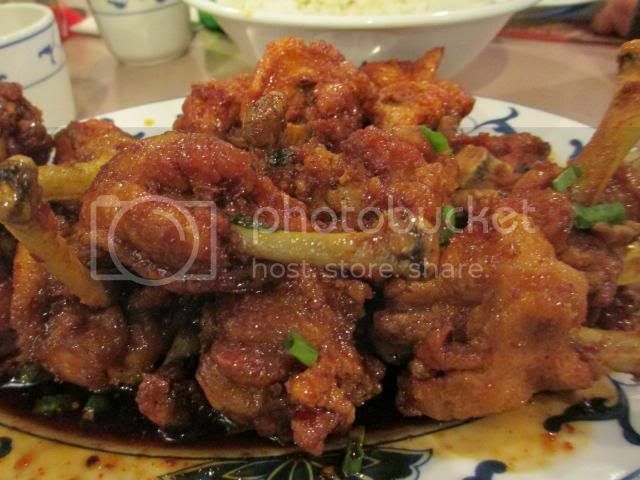 They continue to put our the best Korean chicken wings in Chicagoland. They brought the heat, but not at the expense of flavor. Great Sea is still a GNR in my book, even if it's only for this one dish. It had been way too long for me, too. I had some of the 2x recently and they were as great as ever . . . I really need to get in here more than once every couple of years. Been way too long since I've been to Great Sea, lunch today was as good if not better than ever. Spicy wings, crisp juicy pot stickers and cha chiang mian all top of the game. Wonderful lunch, friendly folks, I will be back soon. Get your wings fix now before you cant. The owner at Great Seas told me tonight that they were "staying open with a new owner" and that her husband was teaching the new owner the recipes so they could keep making everything the same as before.